Birds are an important part of Christmas in Norway. 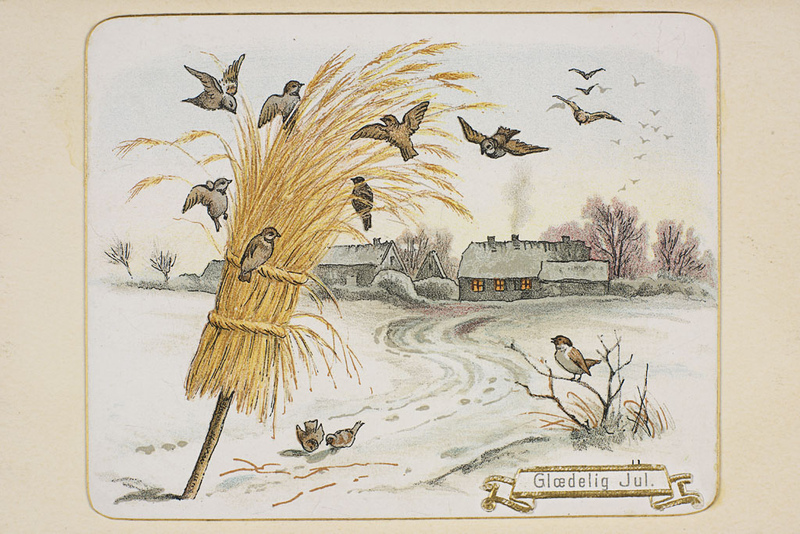 On Christmas Eve, sheaves of wheat or oats are tied to a post or hung on the door, to feed the birds on Christmas morning. This bundle of grain, the julenek, has become a symbol of Christmas in Norway, and a julenek hangs on nearly every door, decorated with bows and ready for avian visitors. It's good to remember birds and all wild creatures this season! Happy Holidays from the whole BirdNote team! And thanks for caring about birds -- today and all year long! Of course, there’s the Christmas tree. And the carols. [More from Trio Mediaeval] And the presents. There’s Nisse, a gnome that cares for all the animals on the farm. Children put out big bowls of porridge for Ulenisse, so he won’t play tricks on them. And on Christmas Eve, sheaves of wheat or oats are tied to a post or hung on the door, to feed the birds on Christmas morning. [Song of European Robin] Birds and all wild creatures must be remembered this season! The bundle of grain, the julenek, has become a symbol of Christmas in Norway, and a julenek hangs on nearly every door, decorated with bows and ready for avian visitors. When the year rolls round again"
Provide a feast for your backyard birds this winter. Learn how at BirdNote.org. Happy Holidays — and God Jul! — from everyone at BirdNote! I’m Mary McCann. Call of the European Robin provided by The Macaulay Library at the Cornell Lab of Ornithology, Ithaca, New York. Large flock recorded by J.C. Roche. Norwegian pronunciations in today's BirdNote were provided by Kim Nesselquist, the Norwegian American Foundation's Executive Director and the Consul of Norway, Seattle Office.